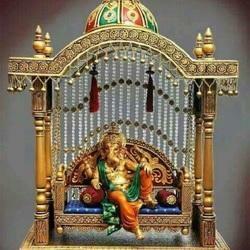 Our product range includes a wide range of geeta sar with krishna and mandir jhula ganesh. 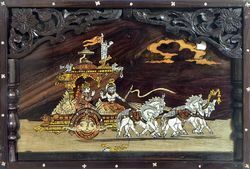 Wall Hanging Hand Crafted Geeta Sar Krishna Mural in Ceramic Crush Material With Wooden Base, Fine Hand Crafted Art Work, Washable Material ,With Natural Deco Paint finish. Purpose = It can be Use personally & can be Gifted also. Sone of our great creations and it is highly appreciated by our clients. To make our clients happy and satisfied, we offer them the best quality products that is manufactured by using the finest quality raw material and latest techniques. We have the experts who are very much experienced and have the capability to make the Jhula too attractive and appealing.